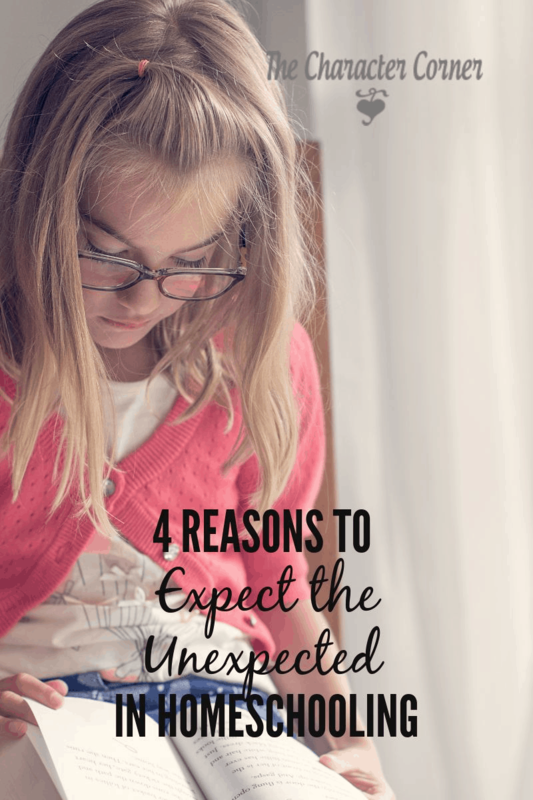 Have you ever thought about the need to expect the unexpected in homeschooling? 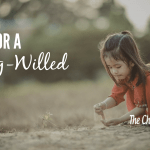 So often we start our homeschooling journey with unrealistic expectations. We picture perfectly behaved kids who LOVE to hop out of bed each morning to joyfully begin their schoolwork. We picture ourselves as calm moms, who are quietly patient yet firm with their kids. 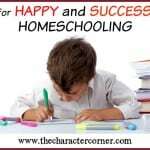 Rarely does the reality of homeschooling meet our lofty expectations. As a result, we can get discouraged and respond wrong. 1. It will keep you calm, and help you not to over-react. I recently wrote a post titled Are You an Over-Reactive Mom, and shared some thoughts to help you if you have that tendency. One thought to add to that post is the importance of expecting things to go wrong. Don’t be surprised when one of your kids doesn’t want to cooperate and do their schoolwork. Don’t be disappointed and stress when they don’t catch on to phonics as fast as your friend’s child did. 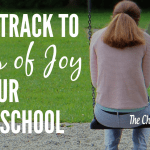 When you have expectations for how your kids are going to learn or act during the school day, you are setting yourself up for disappointment and frustration. You can and should expect them to do their best, but be realistic about what they are capable of. Also, you can and should require obedience and good attitudes, but realize your kids aren’t perfect and will require training and reminding. Remembering that will keep you calm when you need to stop what you’re doing to correct and train them. 2. It will teach your kids the importance of being flexible. When things don’t go as planned, and you have sick kids, one that is being extra ornery, or one that just needs extra help, your kids are watching your reactions. If you are prepared for things to not go exactly as planned, you set a great example for your kids about being flexible when things don’t go the way you want them to, or thought they would. This is such a great way to help that child who doesn’t handle unexpected change well. He/she is watching how you handle things that you didn’t know were coming. When you handle it calmly, remembering to expect those times, it will help that child learn to not fret and worry as much when their plans don’t go as they thought they would. 3. When you let go of your expectations and give your day and plans to God, it keeps you from disappointment. Blessed is he who expects nothing; for he shall not be disappointed. There have been times when I was so excited about doing something with the kids, and I envisioned them being happy and excited about it, and us having a picture perfect time. Imagine my disappointment when my kids didn’t get all that excited about it, and SOME even complained about it. I had set myself up for that disappointment by having those expectations. Sometimes that disappointment would cause me to react with anger, and cause me to say things I should to my kids about their lack of gratitude, or them being spoiled, etc. I have found it is much better to start the day by spending time with God, giving my expectations to Him, leaving those desires with Him, and letting Him determine how the day actually goes. That makes it so much easier when the unexpected happens, because I know that God is the one who is in control, and that He has a plan for the way things actually do go. When the unexpected happens, in my heart I can thank Him, knowing that His plans are better than mine. 4. When you are prepared for things not to be as you expected, you are able to convey love and acceptance to your kids. Let’s say for example that you expect child #2 to learn to read in 3 months, just like child #1 did. However, they struggle and just don’t get it or aren’t ready for it. If you aren’t careful, and prepared for that possibility, they will probably feel your sense of disappointment in them. They will will see it on your face, and feel they have let you down. When we don’t expect them to perform according to certain standards, or like another child, it shows we love them for who they are, and not because of their abilities, or good performance. The same thing is true when your child commits wrong behavior, or makes wrong choices that you never thought any of your kids would make. It’s easy to inadvertently convey to them a lack of acceptance, or love. They need to know we love them unconditionally, and that we are there to love and support them when they do make bad choices. Our kids will make mistakes along the way, as well as what we might consider bad choices. Often they face rejection outside of the home for various reasons, so it is VITAL that we as parent don’t let the unexpected ever cause us to respond in a way that makes them feel anything less than loved and accepted. Our kids need our affirmation and encouragement, and giving it to them is key to keeping their hearts. Don’t be caught off guard by the unexpected as you teach and train your kids. Realize that what you envision for them may not become a reality, and expect that there will be unexpected twists and turns along the way. Remember that God is in control, and commit those kids and all the unexpected things in your parenting and homeschooling to Him! 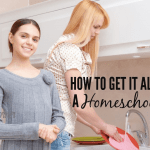 As A Homeschool Mom, How Do I Get It ALL Done? !